2013 Sonora TCA Meet - 1st Place Team! - Ellis Aquatics: The USA Swim Club of Tracy. 2013 Sonora TCA Meet - 1st Place Team! Still waiting on TCA to post the final results.. Short write up is up. 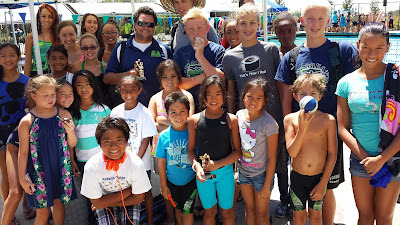 Ellis Aquatics was the defending winner at the TCA Sonora meet this past weekend. 12 year round club teams came to battle it out in the first Short Course Yard meet of the fall season. This was 11 year old Camyle Rosa's first time at the meet. "I actually never knew that we won that meet last year and when I found out, that only made me want the win more. The best part of the win is when the announcer said, "defending their title is Ellis Aquatics" and I also was surprised how we won by almost 300 points! I have never had an experience like that and it was amazing." The final score for the top five teams was Ellis Aquatics 1185 points, Lodi City Swim Club in 2nd with 878, Tuolumne County Aquatics of Sonora in 3rd with 663, Oakdale Aquatics at 463, and Sfrp Rossi Swim Team of San Francisco at 130. 13 year old Keiana Fountaine won high point for the 13-14 girls age bracket. 7 year old Lauryn Lucero won the 8 and under division high point for the team as well. A special congratulations to Keiana Fountaine, she went 55 seconds in the 100y free as an 8th grader! 11 year old Abigial Figueroa picked up her first 11-12 Junior Olympic qualifier times in the 50 yard and 100y Breaststroke events, as did Meigan Loomis in the 50y and 100y freestyle events. Qualifying them for the Winter Junior Olympic Championships.